This book examines the state-building process in Colombia, specifically in the Pacific Coast region. 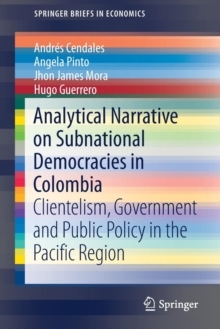 Using the regionally isolated and historically neglected Pacific Coast as a case study, the authors analyze the Colombian nation-building and democratic processes, applying diverse methodology and an interdisciplinary focus. The early chapters lay the foundation of the text through the historical reconstruction of political turmoil in Colombia and the birth of the Revolutionary Armed Forces of Colombia (FARC) and its confrontations with the government establishment. It then moves to a public choice analysis of public policy and clientelism within local democracies. The later chapters test the theoretical models using regional information about governability and election result patterns and discuss a further research agenda. Grounded in behavioral models with clearly defined agents, contingency plans, and outputs, this book will be of use to students studying Latin American political science and public policy, as well as researchers interested in state and nation-building and local governance.